Founded in 1835 Melbourne is the biggest city in Victoria and home to some 4 million people. Sitting on the shores of Port Philip Bay it sprawls inland and can be a chore to drive through despite being named 'the world's most liveable city'. It does, however, have some amazing food and coffee. Princes Bridge spans Melbourne's Yarra River from Swanston Street on the north bank to St Kilda Road on the south bank. Built in 1888 it is on the site of one of the oldest river crossings in Australia and listed on the Victorian Heritage Register. 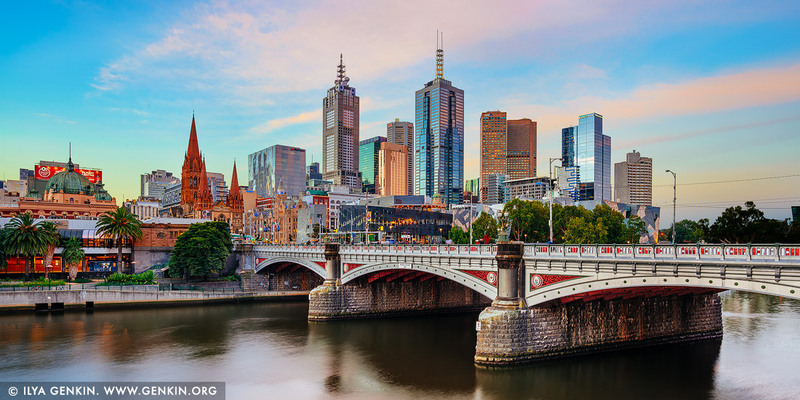 This image id AU-MELBOURNE-0012 of Melbourne, Princes Bridge and Flinders Street Station at Sunset, is copyrighted © by Ilya Genkin. This is not a public domain image.